- Heavy duty Cast Iron Graduated 0 – 90° Range. - Precision Ground Table Surface. - 2 Screw locks provided for setting purposes. - Provides a solid base for mounting vises, fixtures or sub plates for convenient set - ups in inspection, tooling and production. - Manufactured from close grained cast iron. - Casting are stress relieved. - Precision ground flat and square having an accuracy in parallelism and squaress within +/- 0.0004" per 6" length (+/-0.001 mm per 150mm). 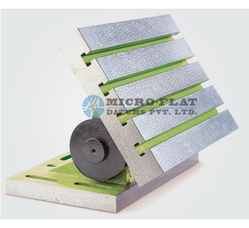 Catering to the requirements of our clients, we are involved in offering Cast Iron Swivel Angle Plate. 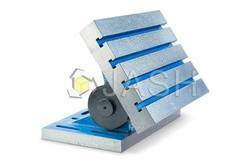 We are a leader in manufacturing and supplying high quality Swivel Angle Plates. These are available as per buyer requirements at affordable rates. Tilting Angle Plate (5" X 4") (Eclipse Type) 3 T slots and 2 slots on base for clamping. Close grain Cast-Iron. Graduated 0-90 degrees.